Synopsis: Wreck-It Ralph (Reilly) plays the villain in an old, beloved arcade game called Fix-It Felix, Jr. After decades of being disliked for being the bad guy, when he really isn’t one, he decides to leave his game to try and win a medal to prove his worth. Along the way he befriends a 9-year-old girl named Vanellope von Schweetz (Silverman), a racer in a game called Sugar Rush, who’s also ostracized because she’s a “glitch.” Together they try to prove their worth to the world, but unknowingly may ultimately bring doom to their respective games. Andrew: Hello readers! This past weekend Sarah and I went on a little date and caught a showing of Wreck-It Ralph, the latest animated film from Walt Disney Animation Studios. That’s right, it’s not a Pixar film, but you honestly wouldn’t know it if you went in without any prior knowledge of the film. 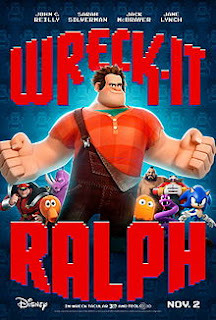 It stars John C. Reilly (Walk Hard: The Dewey Cox Story) as the voice of Wreck-It Ralph, the “bad guy” of a 30-year-old arcade game called Fix-It Felix, Jr. It’s Ralph’s job within his game to play the villain and smash a tenement building to pieces so the namesake of the game, Fix-It Felix, Jr. (30 Rock’s Jack McBrayer) can come along with his magic hammer and fix all the broken windows and be awarded medals by the building’s residents. But it turns out Ralph isn’t really a bad guy, it’s just his role in the video game and he’s tired of living in a dump (literally) and never being given the proper recognition for his contribution to the game’s longevity, so he goes about jumping to other games to try and be the good guy and win himself a medal. Sarah, this is a film that we’ve been looking forward to ever since we saw the trailer many moons ago. Now that we’ve seen it, what did you think of Wreck-It Ralph? Sarah: I loved Wreck-It Ralph! I thought that the cuteness of the characters mixed with the modern and classic video games was genius. We talked about in the preview that we were fine with tht fact that Pixar wasn't involved in this movie and I think Disney succeeded in more ways than one. What did you think about Ralph? 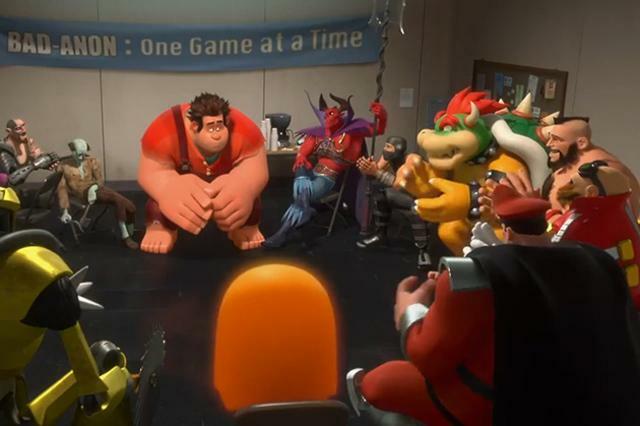 Wreck-It Ralph is full of fantastic scenes using classic video game characters, such as this "Bad Guys Anonymous" scene that kicks the film off. A: In a general sense I think Walt Disney Animation hit a home run with Wreck-It Ralph. It's almost a disservice to say that it's "Toy Story with video games" but it's absolutely true, and I mean that in the best way possible. It's almost like Wreck-It Ralph is an extension of, or a cousin of, the Toy Story trilogy. You get great voice-acting, great animation, a beautiful and vivid universe that comes to life when the humans are away, a great amount of humor for all ages, and most importantly it has incredible heart. S: I agree! I just think that they added a great one to the Disney family. Now here's my question for you: when we were in the movie I didn't hear a lot of laughter from a lot of the kids when more of the older "kids" were laughing...do you think some of the relevance was lost on a younger audience? A: That's a bit of a tricky question. To directly answer the exact question you pose I think yes, some of the older video game references and therefore their "relevance" was lost on the younger kids. I'm sure some of them recognized Bowser or Clyde (the orange ghost from Pac Man) because those characters' games have transcended generations, but I'm also sure they didn't know who Q*bert or Ken and Ryu from Street Fighter are, and I'm sure most kids didn't get the Tapper's bar reference, but I'm sure a lot of older people DID get those references. And that means this movie really has something for everyone. The best animated films are the ones that parents can take their kids to and enjoy just as much, if not more. S: Maybe it was just a tougher crowd because I really didn't hear a lot of kids laughing when they should have been. It's such a heartwarming movie and has a great message like every other Disney movie. I think one of the things I enjoyed the most about Wreck-It Ralph was watching you enjoy it so much. The thing about Disney movies is that they aren't just for kids. They take adults back to a simpler time when they could just enjoy. I give Disney a lot of credit for being able to do that and Wreck-It Ralph is no exception. A: I enjoyed the heck out of all the video game references and jokes, plus all the more subtle aspects of the video game world. Like I loved how the residents of Ralph's game, Fix-It Felix, Jr., all moved around kind of herky-jerky because they were supposed to be 8-bit characters. I loved the world that the filmmakers created, where all the games are connected to one another through the power strip they're all plugged in to, Game Central Station. Even more importantly to the world of Wreck-It Ralph, the filmmakers did a FANTASTIC job setting the rules of the world we were seeing. The best example of this is very early on, in a relatively subtle way, they explain that if die in your own game you can respawn no problem because it's part of your game, but if you die OUTSIDE your game you can't respawn. It sets the stakes and instantly gives you an idea of the world these characters live in. 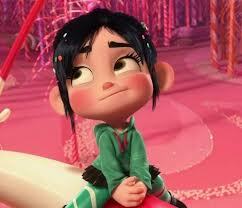 Vanellope von Schweetz, along with having a great name, is quite right - she's adorable. S: We want to keep this one short and simple but I do want to mention that John C. Reiley and the rest of the voice cast was brilliant! They were what really made the movie a success. A: There are a lot of strengths to Wreck-It Ralph, and arguably the strongest is the voice-acting. Pretty much every character in this film had the perfect voice-actor chosen to play them. John C. Reilly as Ralph, McBrayer as Fix-It Felix, Jr., Jane Lynch (Glee) as Sergeant Calhoun a Halo doppelganger called Hero’s Duty, and Sarah Silverman as Vanellope von Schweetz and Alan Tudyk (Steve the Pirate!) as King Candy from a racing game called Sugar Rush are obviously the stars, but even the smaller characters are fantastically voiced. The voices in animated films like this are of paramount importance. Like can you really imagine anyone but Tom Hanks and Tim Allen as Woody and Buzz? I think the voices in Wreck-It Ralph could reach those levels someday. S: I don't know about that, but I agree that everyone was cast perfectly. I know that it seems like a no-brainer since it's not like we would have anyone else in mind for the voices, but we have come to learn that there are some actors who CAN NOT pull off voice acting. (Nicolas Cage in the trailer for The Croods...bleechk). They didn't mess up with Wreck-It Ralph, so well done! A: Here's my last question, and be honest: Did you tear up at all during the final act? S: I did not. That could be a negative, because Disney movies usually ALWAYS make me tear-up but this one didn't. A: That’s crazy to me because I definitely got a little misty-eyed during one particular scene between Ralph and Vanellope. I will say, as my only negative, I thought the movie slowed down a little bit when Ralph got to Sugar Rush. I think the movie used that time well in establishing the world and introducing the Sugar Rush characters, but I kind of wish Ralph had jumped around a bit more. Guess we'll see that in the inevitable sequel! Ok then, final thoughts on Wreck-It Ralph? S: There was so much more to this movie than just a bad guy from a video game. I think that if you are looking to take the family out to the movies any time soon, this is the one to see. It also makes a great date movie! It's genius! Seriously, see this movie. It is a great addition to the Disney family and I think could be an instant classic. FINAL VERDICT: It’s a must-see! I like the way you guys do your reviews, it's a very unique take. Great review though, I really enjoyed this one too! Even though I may not have understood some of the video game references, because I've never been a giant gamer, I still thoroughly enjoyed this one. Thank you Daniel! We really appreciate it! We think it speaks to the quality of the movie that you thoroughly enjoyed Wreck-It Ralph regardless of your history with video games.